Following the article about toxins in beauty products and the heated discussion around it, I decided to unfold the subject further and focus specifically on Toxins in nail polish. The fact that nail polish originates from a car paint gives it a toxic and potentially hazardous past. So which not-so-good chemicals still remain in the formulas or have been added as nail polish evolves? The chemicals we’re talking about today are Dibutyl Phthalate (DBP), Formaldehyde and Toluene. They were nicknamed the ‘toxic trio’ or The Big 3 because of their serious health impacts. The Big 3 Toxins subject is not particularly new. Most major U.S. brands started excluding these toxins from their formulas in 2006 and in Europe as early as 1976. So you would assume that by now most of the major nail polish brands would exclude these chemicals completely. Well, imagine how not-so-pleasantly surprised I was to discover formaldehyde in one of my favourite nail strengtheners – now, in 2015! 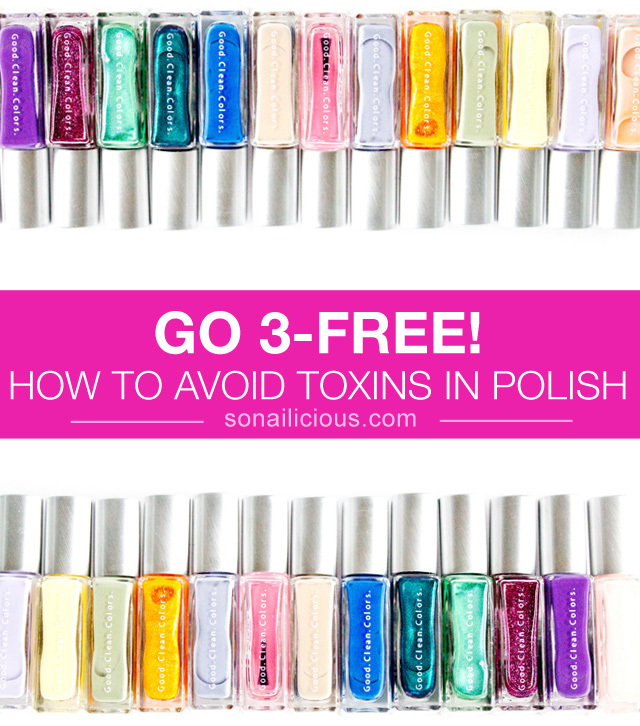 So, why exactly these toxins are so bad, what do they do and most importantly, why should you avoid them in your polish and nail care products? Read on to find out. Found in: some nail polish, but mostly in nail hardeners and nail strengtheners. It is used as a nail-hardening agent. A formaldehyde resin when used in nail polish makes it more long-lasting and resilient. The resin is manufactured from formaldehyde but once the product becomes a resin, the formaldehyde changes chemically and is no longer toxic. However, be aware of formaldehyde in your treatment products! 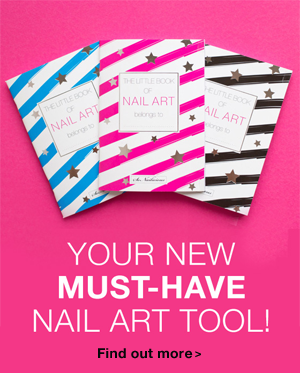 Go check your favourite nail strengthener right now. Why you should avoid it: This chemical was deemed a human carcinogen by The International Agency for Research on Carcinogens (IARC) and has been linked to occupational related cancers: nasal and nasopharyngeal. It can cause eye, nose, throat irritation, asthma, potential effects on the reproductive and neurological systems. Found in: Acrylic paints, varnishes, lacquers, adhesives, glues, paint thinners and shoe polish. Its primary use is as an additive in gasoline. Toluene (other names – methylbenzene, toluol and phenylmethane) is a commonly used solvent that creates a smooth finish across the nail and keeps the pigment from separating in the bottle. It also makes the polish easy to apply. Why you should avoid it: Inhalation of toluene in low to moderate levels can cause tiredness, weakness, uncoordination, memory loss, nausea, loss of appetite, and hearing and color vision loss. Inhaling high levels of toluene in a short time may cause light-headedness, nausea, or sleepiness, unconsciousness and even death. Inhaling this toxic chemical for prolonged periods can affect the central nervous system, cause reproductive harm and asthma. Found in: PVC, adhesives, printing inks, grouting agents used in construction and also consumer products such as cosmetics and nail polish in particular. DBP is a commonly used plasticiser. It’s an oily liquid that is not very volatile so it does not evaporate readily. It is used in nail polish to prevent chipping and cracks. Why you should avoid it: It is a suspected teratogen and endocrine disruptor. 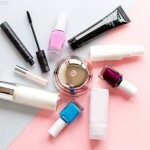 The use of this substance in cosmetics, including nail polishes, is banned in the EU under Directive 76/768/EEC 1976 and in the U.S. all major producers began eliminating this chemical from nail polishes since 2006. DBP was permanently banned in children’s toys. As you see each of these chemicals used in nail polish for a reason. 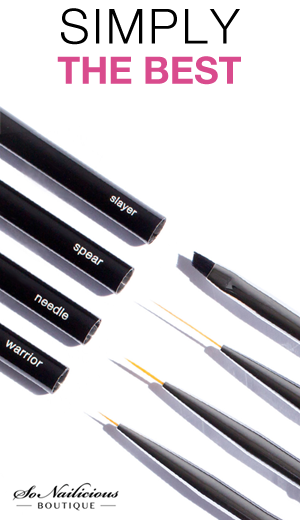 They make it longer lasting, chip-resistant and more durable. However, there are so many 3-free nail polish brands that have been toxin-free for years and have fantastic formulas. For instance, due to strict regulations (the Big 3 chemicals are banned in the EU) all European nail polish brands are guaranteed 3-FREE and many are 5-FREE. Most of the U.S. brands (Essie, OPI, ORLY, etc) are 3-FREE too. However if you’re in doubt whether the nail polish is 3-FREE or not, just read the ingredient list and look for Dibutyl Phthalate (DBP), Formaldehyde and Toluene. Of course, the choice is yours whether you use toxin-free products or not. I’m simply providing information to help you make a more informed choice. I’ve consciously been using and showcasing only 3-FREE and 5-FREE nail polish brands on SoNailicious for a while now. Now I’ll be even more cautious about what nail care and polish I use. Particularly now when I see my husband going though the challenges of fighting with cancer. We all feel invincible when we are 18, but trust me the situation changes after you hit 30-35. Health effects of toxins in nail polish are not hypothetical. 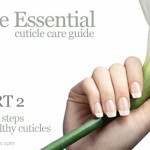 Research studies have documented acute health effects in nail salon workers that were frequently exposed to nail care products with harmful chemicals (read more here). 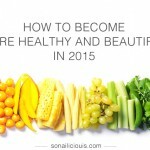 The earlier you start looking after yourself and exclude unnecessary toxins from your life the better! I encourage your to start today – with your stash! What about you? Is it a big consideration for you if a polish is 3-free or not?